Modern technologies are being developed fast, the ongoing expansion of the amount of data, new cloud technologies, the services of data storage in clouds, the services of file hosting and renting virtual servers have become very popular today. The Amazon is a leading company in this area, which provides the services and offers proven cloud-based solutions that meet your business requirements. The Amazon Web Services (AWS) is an infrastructure of the cloud-based web services that provides the reliable, scalable, as well as inexpensive cloud computing services. Introduced by the Amazon.com, Inc. relatively recently, nowadays the servers of Amazon Web Services are deployed in many countries around the world. AWS provides a huge number of services based on Web technologies and cloud-based data processing, the service of selection, rent, managing and unloading of virtual servers (Amazon EC2), the service of data store at the cloud storage and the real-time access via API Web services from any Internet point (Amazon S3), the service of transferring messages (Amazon SQS), the special services for developers of mobile applications and web applications, the services for business, networks, for automation the management, and many others. The flexible AWS cloud solutions are the powerful help in creation the reliable applications with a high level of scaling in AWS cloud, running the applications, and acceleration their work on the level of security. Furthermore, the Amazon Web Services resources are available worldwide, and you can deploy solutions exactly where you and your customers need them. They allow the purchasing and using the infrastructure on-demand: you pay only for the service you use, it is important and ensures significant savings for the business. That's why the Amazon Cloud is so popular with large companies for operating and storing their data. AWS Architecture Diagrams solution extends the ConceptDraw DIAGRAM software with powerful drawing tools, numerous predesigned Amazon icons and AWS simple icons for creation the AWS Architecture Diagrams, describing the use of Amazon Web Services or Amazon Cloud Services, their application for development and implementation the systems running on the AWS infrastructure. The multifarious samples of this solution will give you the good understanding of AWS platform, its structure, services, resources and features, wide opportunities, advantages and benefits from their use. Create easily the illustrative vector graphic diagrams on the base of included templates, which are essential and helpful when designing, description and implementing the AWS infrastructure-based systems. Use them in technical documentation, advertising and marketing materials, in specifications, presentation slides, whitepapers, datasheets, posters, etc. 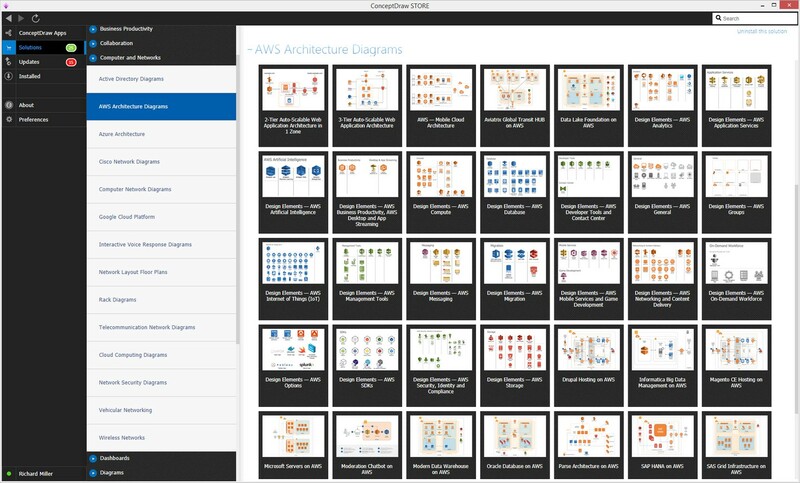 There are 20 stencils libraries containing 358 objects in the AWS Architecture Diagrams solution. New Computer and Networks Solutions for ConceptDraw DIAGRAM. There are a few samples that you see on this page which were created in the ConceptDraw DIAGRAM application by using the AWS Architecture Diagrams solution. Some of the solution's capabilities as well as the professional results which you can achieve are all demonstrated here on this page. All source documents are vector graphic documents which are always available for modifying, reviewing and/or converting to many different formats, such as MS PowerPoint, PDF file, MS Visio, and many other graphic ones from the ConceptDraw Solution Park or ConceptDraw STORE. The AWS Architecture Diagrams solution is available to all ConceptDraw DIAGRAM users to get installed and used while working in the ConceptDraw DIAGRAM diagramming and drawing software. This diagram was created in ConceptDraw DIAGRAM using the combination of libraries from the AWS Architecture Diagrams solution. An experienced user spent 10 minutes creating this sample. This Amazon Web Services (AWS) Architecture diagram sample designed using the tools of AWS Architecture Diagrams solution for ConceptDraw DIAGRAM software describes the simple two-tier auto-scalable architecture with one availability zone (AZ) for a web application running on the Amazon Web Services. This sample contains different types of icons and graphics you can use to illustrate any network architecture because these are universally and easily recognizable icons for this popular resource. There are many cases when the diagram or illustration helps explain the information, concept or thoughts, as well as highlight important moments better than the words or can be used in addition to the words, and AWS thematic is not an exception. 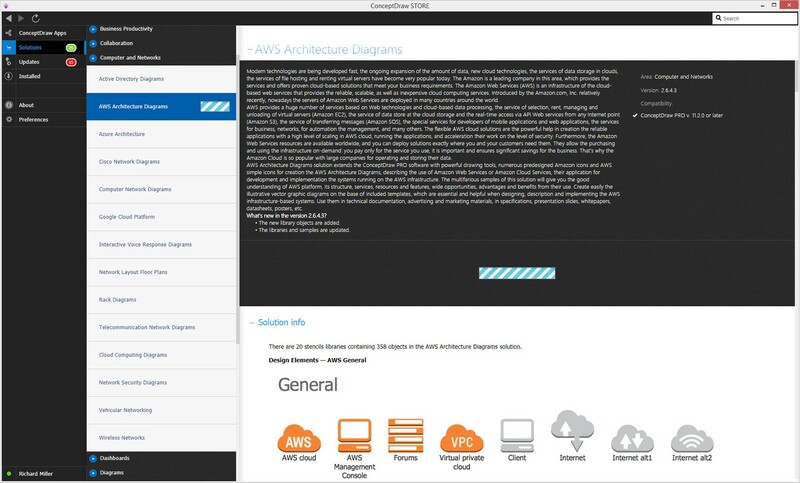 The ConceptDraw's AWS Architecture Diagrams solution makes possible explaining the architecture and infrastructure of the cloud-based applications in a visual form, assists in construction the applications design patterns, lets one visualize the use of different AWS services, and helps make the communication networks designing efficient and easy to digest. At the process of applications development, they are usually broken into the logical blocks called the "tiers", at this each of these blocks has its own appointment. This sample represents the 3-tier Auto-Scalable Web Application Architecture diagram that shows the core network backbone, the distribution layer, and the access layer. No matter how simple or complex is a diagram that you need to draw, the ConceptDraw DIAGRAM software and AWS Architecture Diagrams solution from ConceptDraw Solution Park ensure you that AWS diagrams of any complexity can be produced in minimal time and without efforts. You have a choice - to create them easily with the help of bright, colorful and professional looking vector objects from the AWS Architecture Diagrams solution libraries, or to construct them on the base of ready-made samples. Besides, the creation of any diagram or schematic is a dynamic process, and the items can be easily added or withdrawn from the diagram as necessary. This sample visualizes the Parse’s environment or the Parse architecture on AWS. Parse ensures an extensive set of cloud-based backend services for mobile services and mobile applications developers. Launched in San Francisco not so long ago, in 2012, it provides now the infrastructure and server management for over 180,000 mobile applications developed for Android, iOS, and Windows platforms and successfully working on the millions of mobile devices. Parse is intended for users’ accounts management, clients' disks caching and data storage. The wide AWS abilities including the capacity to handle easily with intensive workloads help Parse work with high performance and high degree of predictability. 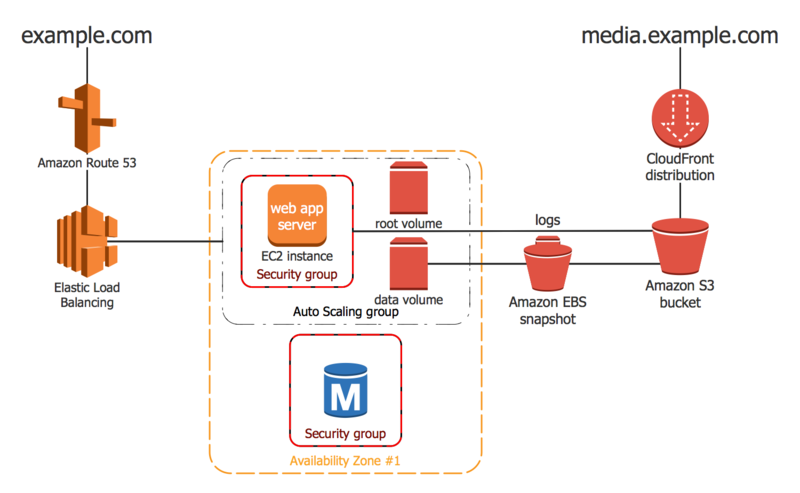 The use of high-throughput and I/O intensive MongoDB clusters running on the Amazon EC2 instances ensures the high scalability and speed in a Parse's work, Elastic Load Balancing lets one distribute connections to web servers that are linked with application servers and communicate with databases, the Amazon EBS is used to make snapshots for each MongoDB shard and then upload them to Amazon S3 bucket. The Amazon S3 lets Parse make the new nodes and to attach them to the cluster in seconds. 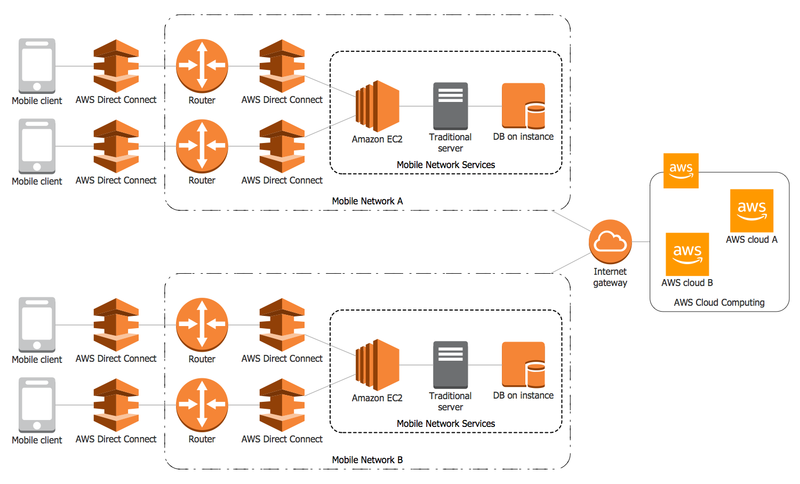 This AWS diagram sample shows the architecture of Mobile Cloud Computing (MCC) that is the combination of wireless networks, mobile computing, and cloud computing. The Mobile Cloud Computing architecture is equally useful and relevant as for the network operators, mobile users and for the cloud computing providers. It uses the computational augmentation approaches, the uniced elastic resources of varied clouds, different network technologies with unrestricted functionality, and makes possible the execution of varied multifunctional mobile applications on the different mobile devices at any place and any time via the Ethernet or Internet channels with the use of various cloud-based resources. The Amazon cloud and other vector stencils you see on this AWS Architecture diagram are available from the AWS Simple Icons v2.4 library from the ConceptDraw's AWS Architecture Diagrams solution for Computer and Networks area. Use them to help build your own Amazon Web Services diagrams and AWS Architecture diagrams in minutes. This sample illustrates the SharePoint Server Reference Architecture for a Public Facing Website Scenario. SharePoint is a well-known Web application platform developed by Microsoft, which is widely used for providing a network of intranet portals, websites, collaboration, social networks, extranets, and business intelligence, for document management and content management. The first launched in 2001, the SharePoint continuously proceeds and expands its opportunities. The Amazon Web Services at its turn offers an extensive range of tools and services for deployment, configuration and running the Microsoft SharePoint Server on the cloud platform. It is especially valuable that AWS ensures a high degree of reliability and security of its services, that's why their use is so popular among the companies of any size and category. Design your own professional-looking diagrams representing the technical information about AWS services and SharePoint Server in a visual form, and then deploy, configure and run successfully the SharePoint Server workloads on AWS. This AWS architecture diagram sample based on the diagram "Image Moderation Chatbot" from the Amazon Web Services website, represents the scheme of work the Image Moderator Chatbot serverless reference architecture. It narrates about the Amazon Rekognition's image moderation and is a how-to for image moderation deep learning feature with a goal to automatically delete the messages that contain some explicit or suggestive images from the channels of popular chat apps by means of use well-known Amazon API Gateway, Amazon Rekognition, and AWS Lambda tools. The set of actions to be undertaken is numbered on the diagram and the comments for these actions are placed at the bottom of this document. Use this trick to avoid the cluttering of your charts, and to make them strict and clear. Make easier designing your Amazon related schemes, diagrams and AWS architecture charts with the help of powerful tools of ConceptDraw's AWS Architecture Diagrams solution. This AWS architecture diagram sample designed now in ConceptDraw DIAGRAM was first published on the Amazon Web Services website as the "Data Lake Foundation on AWS" diagram. Easily constructed with the help of ConceptDraw's specific vector objects, it is accurate and precise, and clearly depicts the deployment of data lake foundation that integrates various AWS Cloud services and components, which users use to migrate their data to the AWS Cloud. We are talking about such popular and well-known services as Amazon Simple Storage Service (Amazon S3), Amazon Elasticsearch Service (Amazon ES), Amazon Athena, Amazon QuickSight, AWS Glue, Amazon Redshift, Amazon Kinesis. These AWS services help the Amazon users in dataset management, data submission, ingest processing, in processes of data store, monitor, analysis, aggregation, transformation, publishing, search, and visualization. The ConceptDraw's predesigned icons of AWS services will help you construct the AWS diagrams of any size and complexity literally in a few moments. This diagram sample represents the AWS architecture diagram constructed on the base of "Aviatrix Global Transit Hub on AWS" diagram from the Amazon Web Services website. It depicts a deployment of Aviatrix Controller and Aviatrix Gateways in a VPC (central virtual private cloud) on AWS to manage the routing between remote networks or spoke VPCs in a hub-and-spoke model. The spoke VPCs can be easily added to the networks by means of tagging them in AWS and Aviatrix Global Transit Hub lets automatically establish a VPN connection between hub VPC and added spoke VPCs applying the special AWS Lambda functions and AWS CloudFormation templates. Typically, a transit network can support several AWS accounts and can be extended with the help of connection a cloud network to the local networks. You can observe several spoke VPCs on this diagram, which primary gateways are connected with a primary gateway in a virtual private cloud. This AWS architecture diagram example demonstrates the deployment of SAP HANA systems on the AWS Cloud. It was designed on the base of "SAP HANA on AWS" diagram posted on the official Amazon Web Services website. SAP HANA is a relational database management system developed by the SAP SE, which allows storing the data, to extract them in response to the requests of different applications, which also includes the ETL capabilities and an application server, and lets one realize an advanced analytics, such as text analytics, text search, predictive analytics, graph data processing, spatial data processing, streaming analytics, etc. This diagram sample is a kind of brief instruction based on the AWS and SAP best practices, and clearly describing how to deploy the fully functional SAP HANA systems on the AWS Cloud, allowing making the optimal configuration to achieve the best results in performance for your SAP HANA system. This sample offers the AWS (Amazon Web Services) architecture diagram designed in ConceptDraw DIAGRAM, based on the "Security and analytics environment on AWS" diagram offered on the Amazon Web Services website and showing deployment of security and analytics environment on AWS Cloud. This sample describes how the enterprise-class security and analytics environment are built on the AWS Cloud using the Splunk Enterprise, the Palo Alto Networks App for Splunk, the Palo Alto Networks VM-Series next-generation firewall, and additional AWS services. The listed technologies assist in protection the workloads from the cyber-attacks of different kinds, ensure the analytics, visibility, and easy reporting in a cloud environment, as well as in on-premises and hybrid environments. Designing your diagrams in ConceptDraw DIAGRAM software, don't forget to give attention not only to the semantic content but also to the design, style and color solution, which have great importance for a final success of your diagram and idea. Both ConceptDraw DIAGRAM diagramming and drawing software and the AWS Architecture Diagrams solution can help creating the AWS architecture you need. The AWS Architecture Diagrams solution can be found in the Computer and Networks area of ConceptDraw STORE application that can be downloaded from this site. Make sure that both ConceptDraw DIAGRAM and ConceptDraw STORE applications are installed on your computer before you get started. After ConceptDraw STORE and ConceptDraw DIAGRAM are downloaded and installed, you can install the AWS Architecture Diagrams solution from the ConceptDraw STORE.